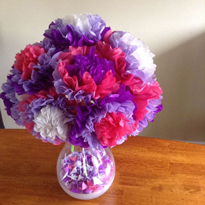 Tissue Paper Flowers are simple, quick, and inexpensive. They are a thoughtful hand made gift that is easy to customize, looks beautiful, and can last a long time. You can whip up a dozen flowers in about an hour. It’s a perfect gift or decoration for Valentine’s Day! To get started you’ll probably have most of these items already laying around your house, if not you can find everything at your local Craft Store. 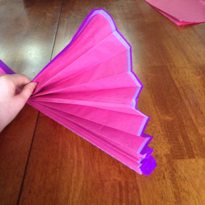 This is what you need to make one dozen tissue paper flowers. One piece of tissue paper makes one flower. It’s easiest to make the flowers in multiples of three. Adjust what you need based on how many flowers you want to make. 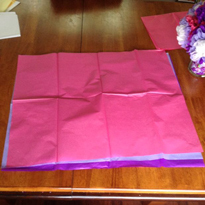 Lay three sheets of unfolded tissue paper down on a flat surface. Stacking them on top of each other. Place the tissue paper stack in front of you portrait style. 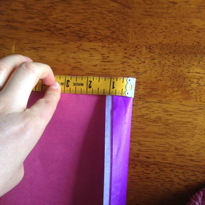 Take the bottom edge and fold in over one inch. Then flip it over and fold it back on the other side. 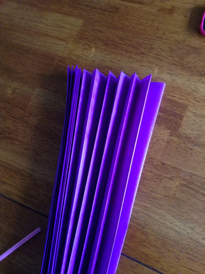 Continue folding your way up the paper one inch at a time. When you are done folding your tissue paper stack should look like an accordion.